Before forming Chestnut Products, Terry had already worked for what was then one of the biggest names in the coatings industry for eight years, during which time he gained vital experience in all aspects of manufacturing, formulation and technical support, as well as the sales and marketing associated with a top brand. The last five years there were spent managing and driving forward what was arguably the top selling wax in the country at the time. Having dealt mainly with industry, Terry saw a need to make quality finishing products available to the serious amateur. He left the company with their full support and blessing and was even able to call upon their expertise and experience for many years afterwards, something he will always be grateful to the original owner for. Based at the time in the south east of England, Terry started Chestnut Products as a van sales company, driving to various outlets and fulfilling orders from stock carried on the van – believe it or not, a Mini Metro van at that! The brand became well known through exhibitions and demand from other parts of the country grew, leading to a major change when the majority of orders were sent by carrier with Terry maintaining the personal touch with more local deliveries. 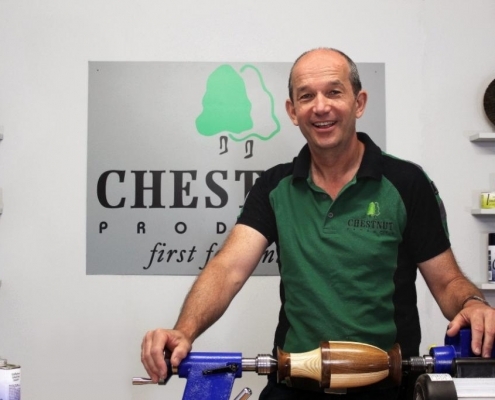 Now over 25 years later, Chestnut Products hold an enviable position of being a major supplier to both hobby and professional woodworkers both in UK, Europe and the rest of the world. It might surprise you to know that despite this massive growth Chestnut Products is still only a very small company and the personal touch continues. Terry remains at the helm and as there are only two other full time employees has to be very hands on in all aspects of the company’s business. Further growth and new markets are planned. These things always take longer than expected, especially with the ever changing regulations regarding materials that can be used in products and the relevant packaging requirements.